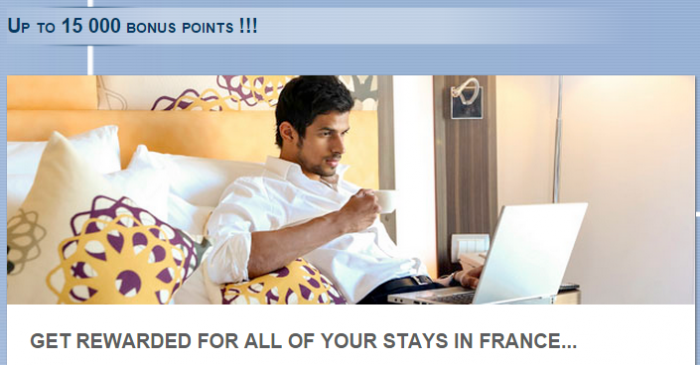 Le Club Accorhotels has launched an up to 15,000 bonus points promotion for stays in France this fall. You will earn increasing number of bonus points for up to 29 stays between September 1 – December 31, 2015. Note that this offer requires you to register for it. The terms and conditions state that this offer would be valid only for those that registered communication from Le Club Accorhotels about it, although I was able to register my account without an issue. This is a nice bonus when combined with other offers that have stays coming up in France this fall. 2. This offer is valid for stays booked between August 25th, 2015 and September 6th, 2015 or between September 22nd, 2015 and November 30th, 2015 and completed between September 1st, 2015 and December 31st, 2015 in one of the hotels participating in the Le Club AccorHotels program in France. on the period and in one of the hotels participating in the Le Club AccorHotels program in France. 5. The loyalty card must be presented at time of booking and displayed at the hotel. 6. The Le Club AccorHotels bonus points will be credited to the member’s account within 7 days after check-out. 7. Under this offer, a stay is understood as one (1) reservation by a member of the loyalty program Le Club AccorHotels , whatever the number of rooms included in the reservation. The reservation made by a member for several rooms will be recognized only for one (1) stay. 8. The offer is not valid with any other promotional offer or advantage and does not apply to groups. 9. This offer is subject to conditions and availability. The conditions of sale reserved public rates specific to each hotel apply. 10. This offer is valid for 29 stays per member during the period of validity of the offer. 11. Only members who have received the communication will benefit from this offer.